Daytime. If St. Mary’s Seminary & University is closed for inclement weather this inherently includes Saint Mary’s Ecumenical Institute and Knott Library. Such decisions are typically made in the early morning, and are communicated by St. Mary’s Ecumenical Institute (EI) as outlined below. If St. Mary’s is closed, non-residents are not allowed on the premises. Evening and weekend. Closing the EI in the evening or on a weekend is the decision of the EI Dean, typically made by 4 p.m. for weeknights, and by 7 a.m. on Saturdays. If St. Mary’s is closed, non-residents are not allowed on the premises. Closure vs. cancellation. If the EI closes because of weather, we hope that the class will ‘meet online’ using Canvas (the EI learning management system which has options for fully synchronous audio-visual class meetings), allowing students to go home and participate virtually in the class session. Instructors are to investigate this possibility in the first week of school, and to inform students thereafter whether a school closure means the class meeting occurs online. Such sessions would be recorded for anyone who is unable to participate. Communication. The EI communicates closures with an announcement on the Website and on Saint Mary’s voicemail (410.864.4000). 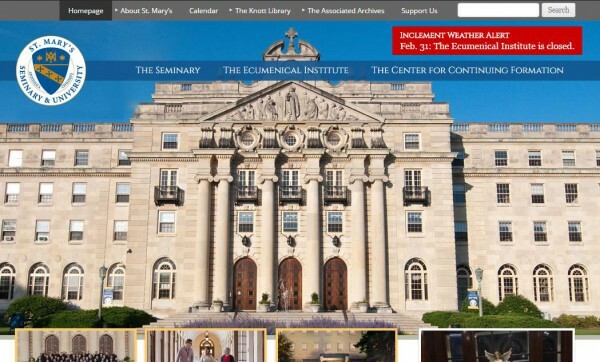 A red alert box appears on all St. Mary’s Seminary & University and St. Mary’s Ecumenical Institute webpages (see the image below) with specific information. Student expectation. A student should expect 1) to be able to learn about any school closure via our website and telephone a minimum of two hours before class begins; and 2) to know in advance of school closure whether his/her class plans to convene online, or make up the session at a later date.